Greenwich Park has just about everything that you could wish for in a park. It is not flat like most of the other Royal Parks and the lay of the land has been used to provide a wide range of landscapes and to provide a setting for numerous and diverse uses from an observatory to a deer park. 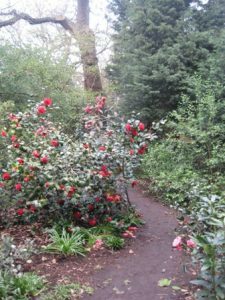 The park has an area of 74 hectares, is located to the south of the River Thames and is a part of the Greenwich World Heritage Site. It is roughly rectangular in shape with the shorter sides of the rectangle to the north and south. 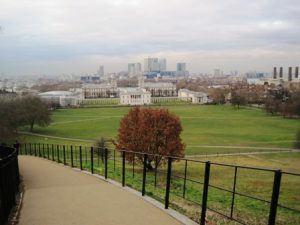 In the north part of the park closest to Greenwich Town Centre is the National Maritime Museum and the Queen’s House which face towards The Old Naval College to the north. Further south the hill in the centre of the park provides astonishing views across Canary Wharf and the City of London. The park is to be home to the 2012 Olympic Games equestrian events. In the north west corner closest to Greenwich Town Centre is a herb garden and a cafe. In the north east corner is a large children’s playground and a boating lake. To the north of the playground across the road (Park Vista) is the Plume of Feathers Public House which is a smallish, friendly pub with a patio area to the rear and which serves food. 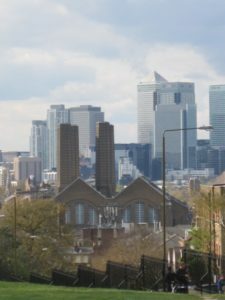 To the south the park rises up to a hill which affords panoramic views of North London and the City and on which the Royal Observatory is sited dominating the landscape. To the rear of the observatory the southern half of the park flattens out and contains a cafe, formal gardens, cricket pitches, a duck pond and a deer park known as The Wilderness. On the western boundary is the Rangers House, rose garden and the remains of Queen Caroline’s residence in the form of her sunken bath (see Queen Caroline’s Bath below). Beyond the park to the east on the other side of the road (Maze Hill) is the folly Vanburgh Castle. To the south of the park are the green open spaces of Blackheath surrounded by upmarket Georgian houses. To the south west is Blackheath Town Centre with its boutiques, shops, restaurants and public houses. Queen Caroline’s Bath is in the south west corner of the park and is all that remains of Montague House which was the home between 1798 and 1814 of Caroline of Brunswick. She became Princess of Wales in 1795 on her marriage in 1795 to George, Prince of Wales who succeeded to the throne as George IV in 1820. They lived separate lives from 1796 and she was never crowned Queen. It is claimed that the house was used by the Queen for orgies which were reputedly her response to the dalliances of George IV with his mistresses. The house was demolished by order of her husband after she had departed for Holland in 1814. Next to Queen Caroline’s Bath is a Georgian villa previously used by the Park Ranger and is now home to the Wernher Collection. These works of art include medieval and renaissance paintings, tapestries, pottery sculptures and jewellery collected by Julius Wernher who made a fortune in the diamond fields of South Africa in the 19th century. The rose garden to the front of the house is planted with 116 varieties of rose and is open all year. It is stunning when in full bloom. Adult £6.50, child £3.90. Open 1 Apr-30 July and 16 Aug-30 September Sunday-Wednesday (closed bank holidays). Entry is by guided tour which take place twice a day at 11:30am and 2:00pm. The tour takes about 1 1/2 hours. Vanburgh Castle is a mock medieval castle in brown brick with turrets and a copper spire, it was designed by architect John Vanbrugh as his residence in 1726. Vanbrugh designed Castle Howard and Blenheim Palace and was appointed surveyor to Greenwich Hospital (now known as the Old Royal Naval College) as Wren’s successor. Vanbrugh, who had been imprisoned in the Bastille in 1692 on suspicion of being a spy, called his castle ‘the Bastille’. The Wilderness is in the south east corner of the park and is home to what remains of Henry VIII’s deer. The deer live within an area bounded to the south and east by the park walls. The north and western side are enclosed by a fence which in turn is surrounded by shrubbery and trees to form a woodland area with paths from which the deer can be viewed without disturbing them. This tranquil area is relatively unvisited and lovely to walk through. Greenwich Park was enclosed by the Duke of Gloucester in the 15th century and probably used for hawking. Henry VIII, who was fond of hunting, introduced deer in 1515. James I enclosed the park with a 12 foot high brick wall which was two miles long and most of which survives. The park was landscaped in the 17th century probably by André Le Nôtre and was opened to the public in the 18th century.